Recycling means no more than taking paper, aluminum and glass to the proper place for disposal. 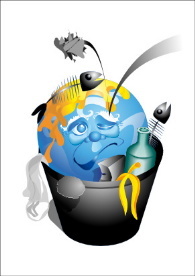 There is a completely new world open to those who know and understand what recycling really means. Recycling is looking at something and seeing it in a completely new light - What could this item be with a little reworking and imagination? Add any fat-free food scraps such as leftovers, peels and cores to a compost pile. Use water you cook vegetables or fruit in to water plants. It's full of nutrients. Use bottles and jars for storage or gift containers. Pringles cans make good storage for saltine crackers and keep them fresh. Cans can be used for cookie cutters, pencil holders or a play phone for your child. Use butter containers for storage in your craft room or shop. Bread bags can be woven into doormats or used to wrap sandwiches for work. Chipped or broken dishes make great mosaics for garden art. Old flatware makes unique mobiles, jewelry or drawer pulls. Save the fat from your deep fryer and learn to make soap with it. Use woven potato sacks to scrub grill racks, pots and pans. Make a bottle tree for your garden with old wine bottles. Ever notice how much the motherboard looks like an aerial view of a big city? Well, remove it, do some fine detail painting, frame it and use it as an art piece. Make a robot out of the various pieces. Use computer chips to make jewelry, tiny picture frames or game pieces. Use the LED lights and wiring in a dollhouse. Create pop art from different components. Use monitor as a shadow box. Tack to a tree, spread with peanut butter and let the birds have a feast. Use as a unique textured clock face. Roof a doghouse. Don't have enough? Roof a birdhouse. Place cedar shingles in your closets to shoo away moths. Run cedar shingles through a chipper and use as mulch. Make your child a swing. Make a planter or raised bed by stacking them. Learn how to make sandals from tire treads. Make a bumper for your boat. Keep your trash can from overturning by placing it in a tire. Make your own paper from the waste paper you usually throw away. Fun and easy! Cut pictures and images from magazines for clip art and decoupage projects. Create your own note pads using the back of letters you receive. Create pi�atas and sell them on eBay. Create photo mats from gift boxes and cereal boxes. Cover with fabric or paper. Make an origami mobile from colorful magazines and gift-wrap. Just because a fabric is worn or faded, doesn't mean it is ready to discard. Use it up and have less to throw away. Make a unique patchwork quilt, apron, vest, wall hanging or floor cloth. Make safe, soft, washable stuffed animals with sewn eyes and mouths for babies. Make a rag doll and her wardrobe. Make washable bed clothes for your dog. Create your own washable shopping bags. Make a warm, quilted crazy quilt or lap cover. Use for appliqu�ing on clothing, cushions and throws. Make hand warmers filled with rice to be heated in the microwave. Cut in strips and braid into a new scarf. Make your pet a chew toy. Make a doll's wardrobe; shoes, gloves, hats, vests and coats. Make fringe of it and add to a vest, pocketbook or jeans pocket. Use in arts and crafts or for jewelry making. Make patches for elbows and knees. Braid old silk ties into a unique belt and add a jeweled buckle or braid a dog collar. Make a clip on tie or a bow tie. Make a cushion cover and add pearls and lace. Make a fancy hanky with fine embroidery. Make a new cover for an old lampshade. Glue or stitch on new braid or bead trim. "What does this do?" Leak, hold something, hang, hold up, revolve, absorb, cover, etc. "What do I need that is similar to this item?" Punctured water hoses are good for drip irrigation in your garden. Use a commode tank for a planter in your garden by spraying with a textured paint. Add a glass top and legs to an old door for a desk or occasional table. Window frames can be used for garden art or as picture frames in your home. Remove the tub from a dryer, paint it to match your d�cor, turn it upside down and place a light under it to shine through the holes. Use the top of an old card table for the top and you have created a unique coffee table. If, you still can find absolutely no use for something, you no longer need, give it to someone who can use it. Join a chapter of your local free cycle and offer it online. You can find one in your community online. But, before you call Free-cycle, lay it aside for a few days and see if the needs of your everyday life present a solution. A need might spark your imagination as you seek creative uses for household discards. That is, after all is said and done, what recycling is all about.